Polli Mangol Karmoshuchi (PMK) Job Circular 2019 has been published on online job portal and also find on my website BD Jobs Careers.PMK is a leading national level developmental organization located in headquartered at Zirabo, Ashulia, Dhaka. It was initiated by the voluntary efforts of a group of local men and women. It was registered formally in 1988 with the Directorate of Social Service and later in 1993 with NGO Affairs Bureau to receive foreign donations. PMK was initiated with the inspiration and leadership of Ms. Kamrun Nahar, the present Chief Executive of the organization. Ms. Nahar received cooperation and all out support from her spouse Mr. Dewan Abdul Mannan who is a philanthropist and an established businessman.A society, which is economically productive and equitable, socially just, environmentally sound and effectively democratic.Participatory sustainable development provided institutional support to the poor (particularly women).The overall objective of PMK is to alleviate the poverty of the poor and very poor families and empower the women on social and economic aspects.Recently this organisation hire 650 new Manpower.If you interested see the Polli Mangol Karmoshuchi (PMK) Job Circular 2019 circular and Apply now!! ■ Organization name: Polli Mangol Karmoshuchi (PMK) . ■ Job Types: NGO job. 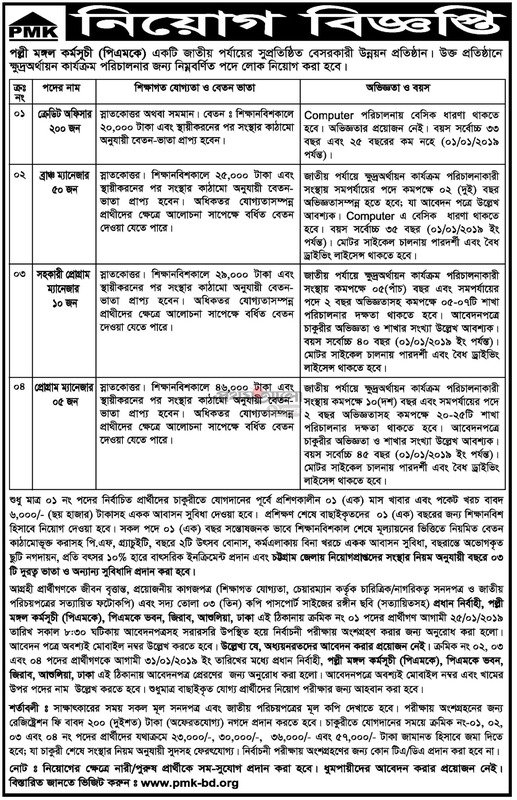 ■ Job location:Any where in Bangladesh. This entry was posted in All Jobs, BD Jobs, Dhaka Jobs, Graduate Jobs, International Jobs, Jobs Notice, Marketing/Sales, MBA Jobs, NGO Jobs, Private Job, SSC Pass Jobs, Today Job and tagged polli mangol karmoshuchi (pmk) job circular 2017 by Bappy. Bookmark the permalink.